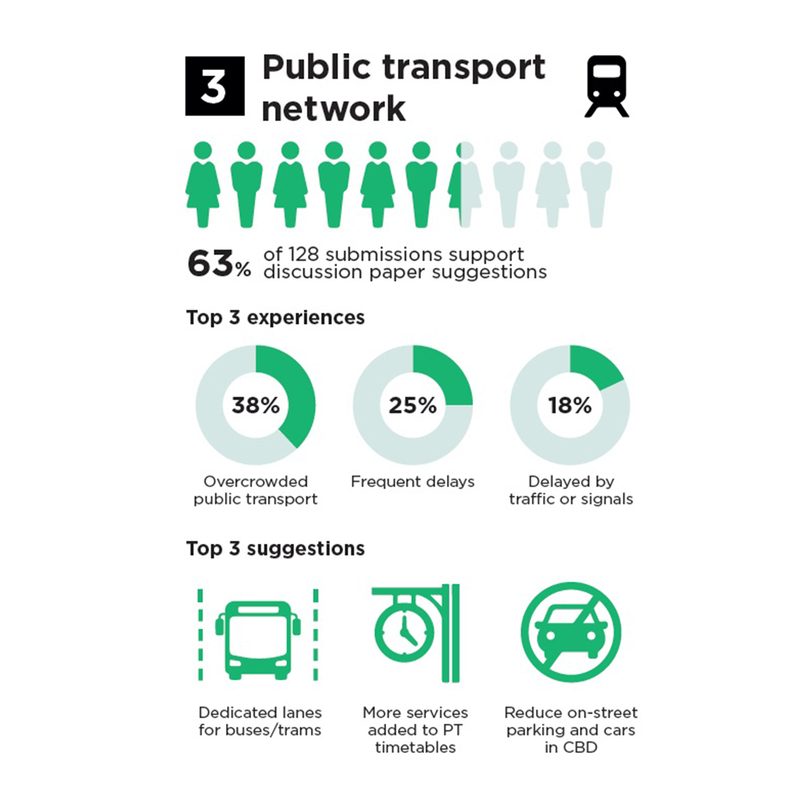 A City of Melbourne-led transport discussion has yielded extensive feedback from Victorians, with pedestrians and public transport users reporting their top experience as feeling overcrowded. Transport portfolio chair Councillor Nicolas Frances Gilley said an unprecedented number of responses to the Walking, City Space, Public Transport, Cycling, Motor Vehicles, Parking, Emerging Technology and Transport Pricing discussion papers were received. “With 1300 submissions and 1500 social media comments, this is the most responses we’ve ever had when asking the community to give us their feedback on a topic. We heard from a wide range of postcodes throughout Victoria; including regional areas such as Ballarat,” Cr Frances Gilley said. “We have prioritised walking as the most important travel choice in our city, supported by cycling and public transport. Incidentally, these are the three topics that generated the most feedback. 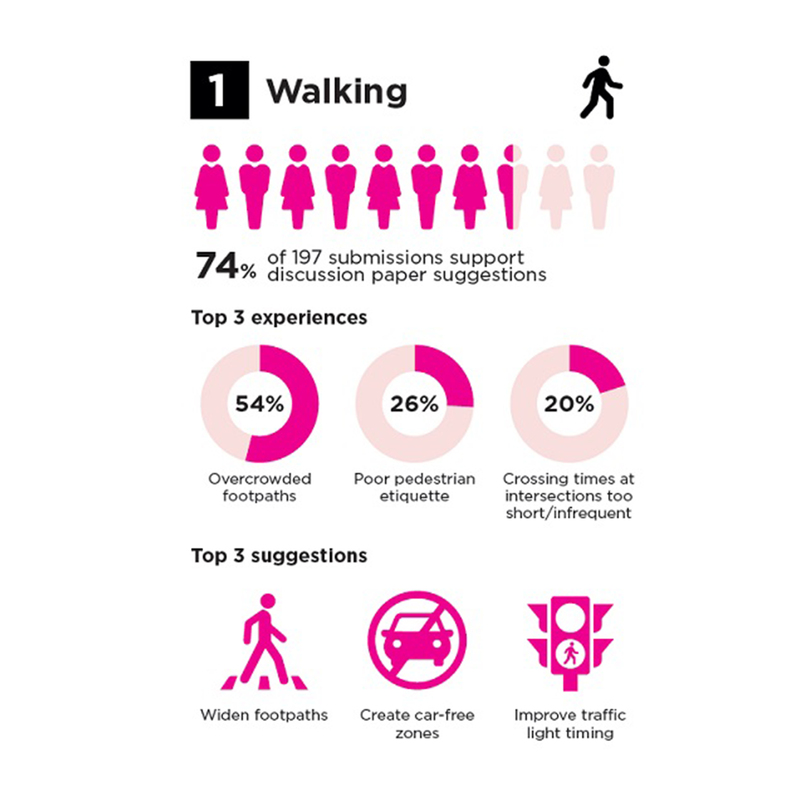 More than half of respondents (54 per cent) to the Walking paper said they had experienced ‘overcrowding on footpaths’. The other top experiences were ‘poor pedestrian etiquette’ (21 per cent) and ‘crossing times at intersections too short/infrequent’ (20 per cent). 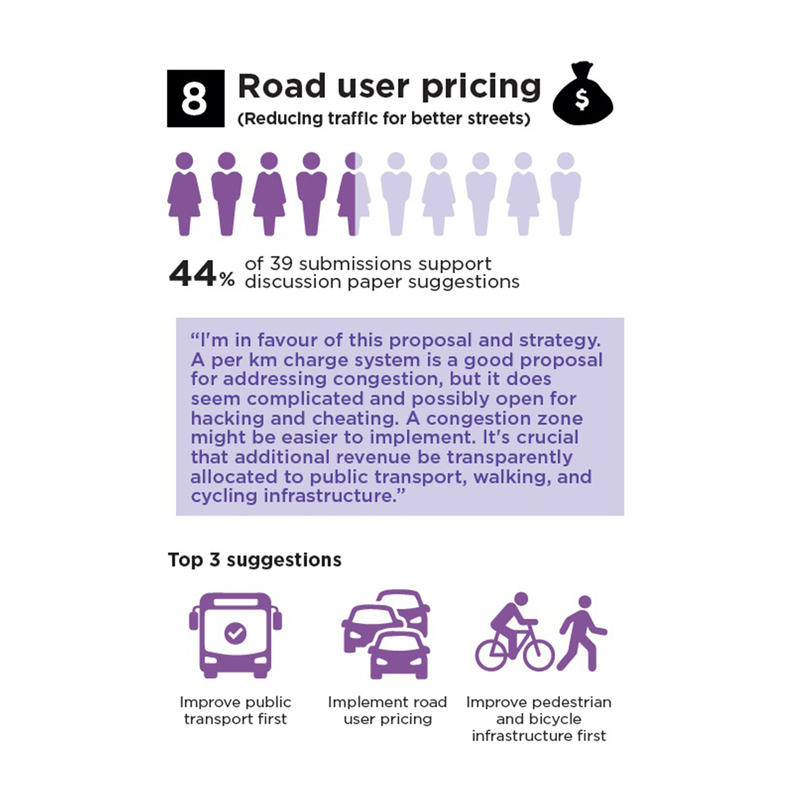 The top three unprompted suggestions to combat these issues were: to widen footpaths (27 per cent), create car free zones (24 per cent) and improve traffic light timing (18 per cent). 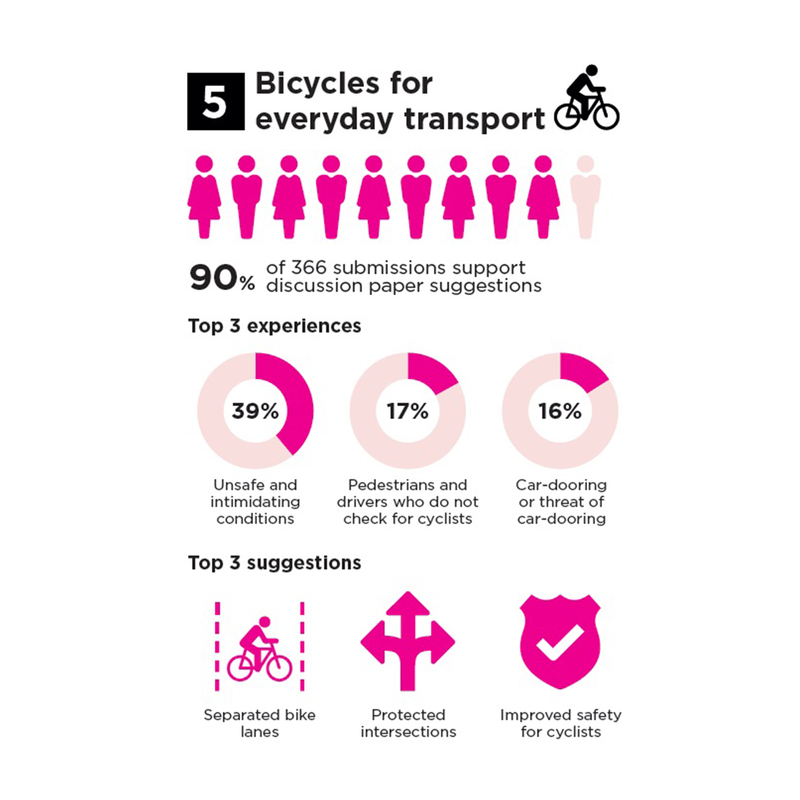 Of the eight topics tested, cycling received the greatest number of responses (366), with two out of five community members reporting their top experience as ‘unsafe and intimidating’ and suggesting protected bike lanes is the solution. Like walking, the number one experience of public transport in Melbourne was of ‘feeling overcrowded’ (38 per cent). 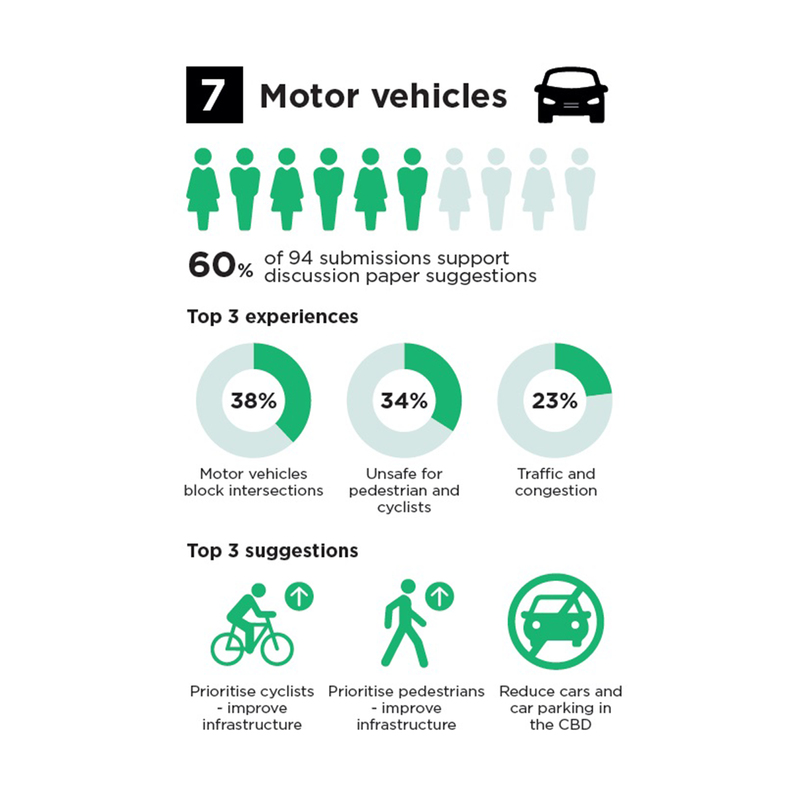 The top experiences regarding motor vehicles were ‘motor vehicles block intersections’ (38 per cent), ‘unsafe for pedestrians and cyclists’ (34 per cent) and ‘traffic and congestion’ (23 per cent). 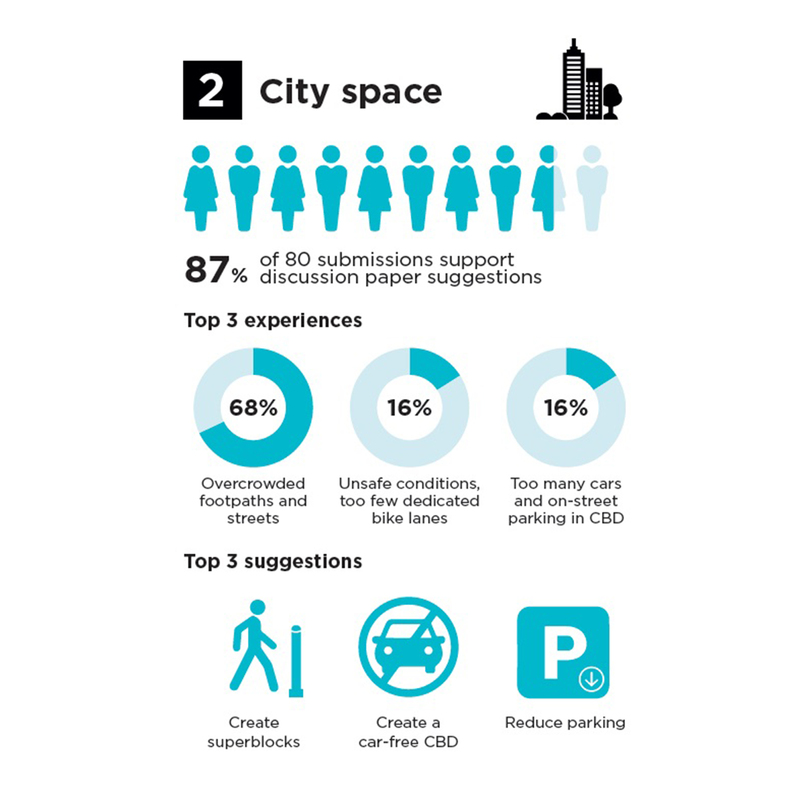 In suggesting ways to address motor vehicle issues, almost half (47 per cent) of contributors expressed a desire to reduce vehicle access in the CBD. “While we received overwhelming support for many of the ideas raised in the discussion papers, we also received criticisms and concerns. All feedback will shape the new Transport Strategy we’re releasing early next year,” Cr Frances Gilley said. 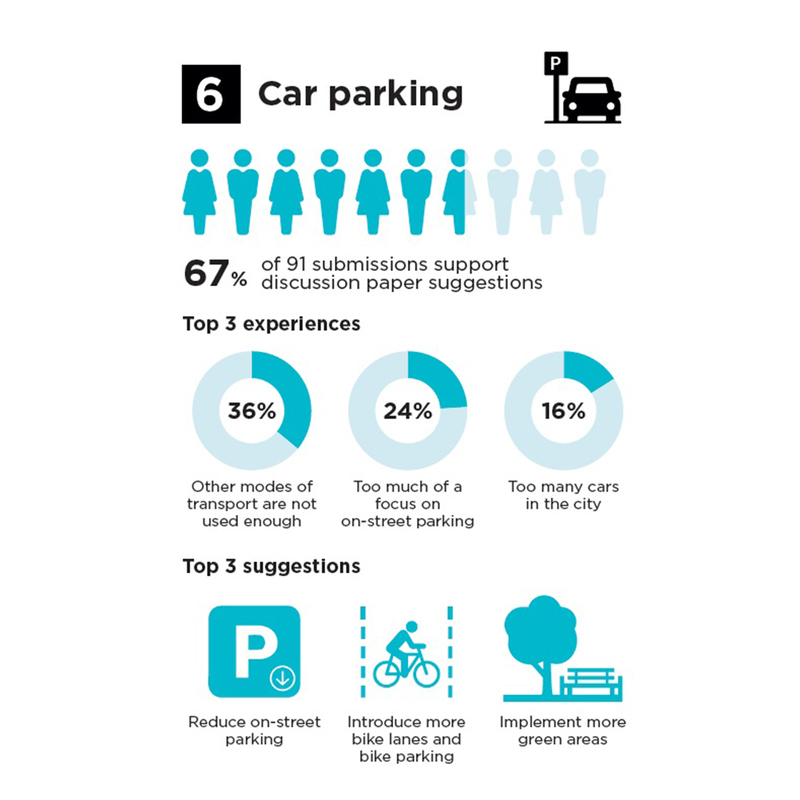 More than 1300 submissions on eight transport topics were received through the City’s Participate Melbourne website and Participate ideas forum, via mail and email from April to July 2018. A further 1500 social media comments were captured as part of the debate. 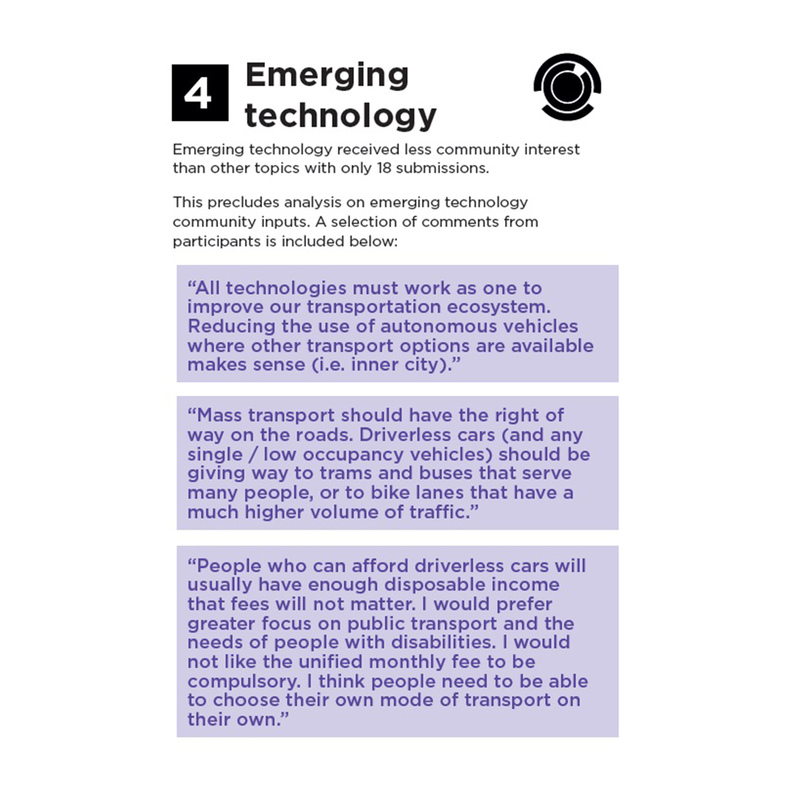 The submissions were in response to eight discussion papers, which presented evidence, best practice from other cities, options and ideas for consideration to encourage community debate and to prompt discussion to inform the City of Melbourne’s draft Transport Strategy.